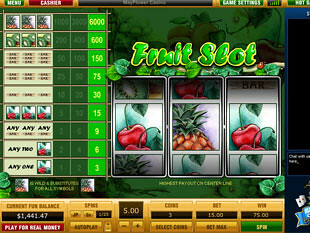 Fruit Slot 1 Line is extremely juicy game that certainly will give you fruit mood as well as unique gambling experience. Thanks to the great bright graphics you can easily find yourself in the cool shadow of the summer garden where trees are heavily laden with the ripe fruits. Here you can pick any fruit you want, even the biggest and the sweetest one – top jackpot of 6,000 coins or |$30,000. This classic game can be found in no download format and you can play it instantly in the net. Fruit Slot has following symbols that will really delight your eyes while spinning on the screen: Triple Bar, Double Bar, Single Bar, Cherries and Kiwi. Special game symbol is Pineapple. 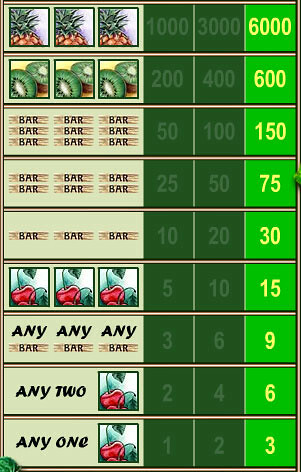 This classic slot machine offers you following coin nominals to choose from: $0.01, $0.05, $0.10, $0.20, $0.25, $0.50, $1.00, $3.00, $5.00. The minimum bet is $0.01, the maximum one is $15.00. The highest fruit jackpot is 6,000 coins or $30,000 for 3 Pineapple, if you play with maximum bet. The second fruit jackpot is 3,000 coins or $15,000 for 3 Pineapple, if you stake 2 coins per line. The third fruit jackpot is 1,000 coins or $5,000 for 3 Pineapple, if you stake 1 coin per line. The wild symbol is Pineapple that acts as a substitute which replaces the lacking symbols and makes the winning combination complete. Note that this symbol is the key for the top jackpot win. Fruit Slot will absolutely be to the classic game experts liking who give preference to stylish design, high quality graphics, simple rules and considerable jackpots.